Yesterday I saw an article that I think capsulizes what has gone wrong with the direction of our country. The article reported that Senator Elizabeth Warren, that darling of the progressives, wants to send every senior citizen in the country a check for $580. Why? These days, I’m not sure that there actually needs to be a reason for a politician to propose a direct government payment to some constituency or another, but the stated reason is that Senator Warren believes the payment is needed because the cost of living for Social Security recipients increased last year. Social Security benefit payments already are indexed to inflation, of course, but this year the formula that calculates the cost of living indicated there should be no increase. So why do we need to make a $580 payment? Well, Senator Warren contends that “Congress’s formula is volatile and does a poor job of reflecting what older Americans actually spend.” She apparently has more perfect insight into the true spending habits of seniors. She notes that part of the reason why the index didn’t increase this year is that gas prices fell and argues that seniors don’t drive as much as other Americans. If there’s an empirical basis for that conclusion, I haven’t seen it, and working stiffs who walk to work, or take public transportation, might properly be skeptical of that claim. But in any case it makes no sense as a policy matter: in past years, when gas prices have surged, the existing formula has yielded increases to Social Security payments. So if seniors, in fact, drive less than other Americans, then in prior years they got a windfall when their benefit payments increased to reflect higher gas costs that they weren’t paying. In short, even if the cost of living formula is improperly weighted as to gas prices given senior spending habits, the advantages and disadvantages even out. How did Senator Warren come up with the proposal to send Social Security recipients a check for $580, or about 3.9 percent of their current benefits? According to the article linked above, it’s not by using the alternative inflation calculation Democrats propose for seniors, which would produce a 0.6 percent increase in benefits. 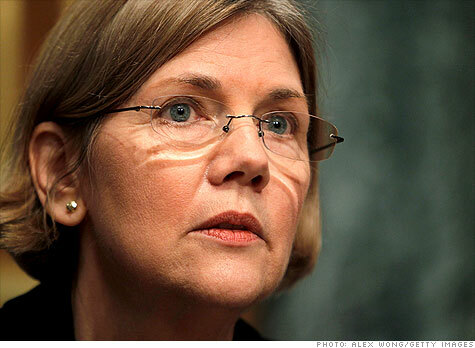 No, according to Senator Warren 3.9 percent represents the average increase of compensation for CEOs last year. It’s not clear how that 3.9 percent number was calculated and which CEOs were included in any analysis that was done — was it limited to CEOs of America’s largest public companies, for example, or did it include the CEOs or proprietors of every business in the country? — but in any case there is no correlation between “CEO compensation” and Social Security benefit levels. You might as well determine Social Security payment increases by looking to changes in the salaries of NBA players, or law school professors, or federal bureaucrats, or the presidents of unions. So why choose CEOs? Because people like Senator Warren consider them to be the evil greedheads in our society. They make lots of money and run impersonal corporations — so they must be evil by definition. Of course, the CEOs of public companies have enormous management responsibilities, their salaries are set by boards of directors whose members can be removed by shareholder vote and paid by the corporations themselves, and they often get sacked if their company is struggling. But those realities don’t matter. Senator Warren’s proposal will allow some people to argue that Congress favors CEOs over senior citizens. And, of course, there are a lot more senior citizens than CEOs. This is what we’ve come down to: politicians like Senator Elizabeth Warren will do just about anything to rationalize the government cutting checks to directly pay off a chunk of the population and build her resume as a populist icon. She’s not alone, of course, which is why we have a federal government that runs jaw-dropping annual deficits of hundreds of billions of dollars despite taking in record levels of tax revenue. I’m afraid that the system is broken. Any public relations professional worth her salt will tell you: when you are dealing with an unfavorable news story — one that you know is going to have a negative impact — the best approach is to get ahead of the story, get all of the information out, and at least avoid the possibility that the story becomes a running, multi-day issue. Lance the boil, drain the pus, and move on. Elizabeth Warren’s campaign must not employ a public relations person. If it does, she isn’t very good at her job — because the story of Warren’s alleged Cherokee ancestry has become a never-ending story in Warren’s campaign for election to the U.S. Senate from Massachusetts. Every day, seemingly, there is some new revelation that puts Warren on the defensive, interferes with her intended “message,” and distracts from the issues she thinks are important. On Wednesday, for example, Warren acknowledged for the first time that two law schools that identified her as Native American did so because she identified herself as such, based on her understanding of “family lore.” Her admission is just the latest in a series of statements about the issue — some of which arguably are inconsistent — that have just encouraged the press to dig ever deeper into the history of Warren’s employment, whether she identified herself as Native American, and whether there is any proof of actual Cherokee ancestry in her family tree. I don’t think a candidate’s race, or self-reported minority status, has anything to do with fitness to serve as a U.S. Senator. On the other hand, I think a candidate’s truthfulness, credibility, and ability to deal with a crisis are relevant — and Warren seems to be falling short in all of those categories. The Native American story has dominated the headlines for a month now, and for that Warren has only herself to blame. Her statements and partial disclosures have a whiff of embarrassed shiftiness about them that have made a minor issue into a major one and, at the same time, made her look evasive and inept. Although her race shouldn’t affect a voter’s decision about her, her apparent inability to give a satisfactory explanation of her actions reasonably could.